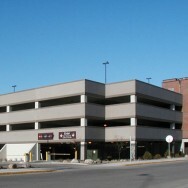 Similar in structure to the Stinson-Kennedy parking ramp, the 645-stall R&D/Techne parking ramp is post-tensioned concrete with encapsulated post-tensioned cables and epoxy-coated reinforcing bars. All reinforcing is with high performance concrete and 2-inch top cover. Precast concrete spandrel panels are used along the slab edges. All levels use post-tensioned beams and slabs. With the exception of a portion of level one, bays are 60′-0″ x 22′-0″. 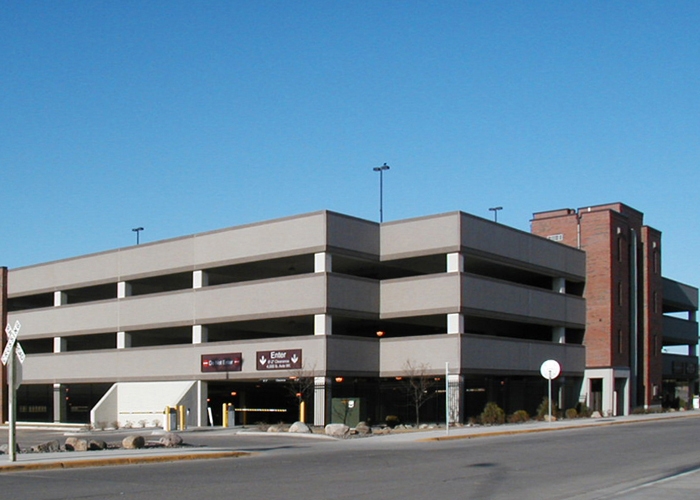 Because of the high water table and contaminated soils on the project site, the contractor wanted to keep excavation to a minimum, so MBJ designed the structure using a concrete flat plate with two rows of interior columns at the ends of the parking stalls. Masonry bearing walls with concrete flat floor slabs were used in the elevator and stair lobby area, which is isolated from the ramp with an expansion joint.